Harper’s government officially announced in recent weeks a new Border Security deal with the US. However, little press space was given to the ugly twin of this deal – the Canada-United States Regulatory Cooperation Council (RCC) and their “Joint Action Plan”. The RCC was set up to “streamline” regulations in four economic sectors engaged in cross-border trade. These sectors are Food &Agriculture, Transportation, Energy and Environment and Personal Care Products. But a funny thing happened on the way to the press release for the RCC’s Joint Action Plan. The word “Energy” was dropped from the Energy and Environment sector. That’s right. Never mind that energy, including oil, natural gas and hydroelectricity, is arguably the most important sector of Canada-US trade in today’s constrained energy supply world. 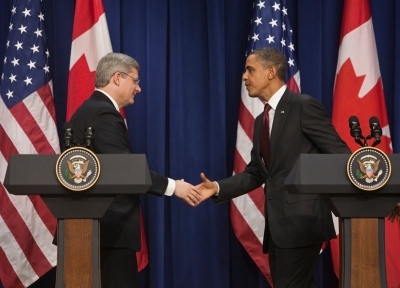 Mounting opposition to pipeline development on both sides of the border make the Energy word a bit loaded politically for Harper and especially Obama right now. (Visions of the protesters surrounding the White House and the BC First Nations announcement of opposition to the Northern Gateway pipeline float in my head as I write this). At any rate, it was conveniently dropped. The new Environment-only sector in the Action Plan concerns itself with fairly benign co-operation on air quality standards for emissions from light duty vehicles and trains and levels of particulate matter in air. To understand what poison pills may await us in the not-talked-about-but-still-there Energy trade sector, a look at the RCC Consultation Report released in February of this year is required. Streamline permissions for and construction of new cross-border energy infrastructure, e.g.,a single Canada–U.S. regime for permitting oil and gas pipelines. Ensure common approaches to nuclear liability in the event of litigation arising from nuclear incidents. Avoid policies that discriminate against particular fuel sources, such as low-carbon fuel standards (for types of crude oil) or renewable electricity standards (for large-scale hydro). As is always the case, the public is the last to find out the government’s plans, but it takes only a modicum of common sense to see that Harper’s moving of the Environmental Assessment Process to the National Energy Board from the Ministry of Environment, the subsequently announced streamlining of the Environmental Assessment Process, and the budget cuts to the Ministry Environment resulting in fewer and fewer monitoring facilities and scientists to staff them or to write reports on environmental implications of resource extraction are all related to establishing a “single Canada–U.S. regime” for pipelines and other cross-border infrastructure. In the wake of both the Fukushima disaster in Japan and the privatization of the Canada’s nuclear industry, the limiting of liability in the wake of nuclear accidents is particularly chilling. One expects that like the US (which, for example, limits liability on the costs of oil spills to a ridiculously low amount in dollar terms), we can expect to see similar regulations in Canada regarding nuclear accidents. And finally, neither Tar Sands oil nor hydroelectricity will be “discriminated” against in the future by regulations in either country. The term “Large-scale” hydro projects remains undefined in the document. But surely Site C Dam would qualify for non-discrimination and perhaps some of the larger ruin-of-the-river projects. The RCC documents are all written with the outdated and disproven arguments of increased “customer choice” and “decreased customer cost”, hand-in-hand with public safety and environmental protection enhancement. The public knows none of this is true. But Harper marches on, head down and in step with his corporate buddies, to the beat of the trickle-down economics drum, while global markets implode, citizens arise en masse and peak everything envelopes the world. No wonder he and Obama need to continue to build a police security state to enforce their policies on us. Nelle Maxey is a grandmother who lives in the beautiful Slocan Valley in south-eastern BC. She believes it is her obligation as a citizen to concern herself with the policies and politics of government at the federal, provincial and local level. This entry was posted in Energy, Organizing, Their Governments. Bookmark the permalink.